In an international encyclopedia, a proper place is definitely to be devoted to the Law on Tort. This legal area is important for lawyer and citizen alike. The problems of prevention of harm and loss allocation are not only extremely diverse but also universal and fundamental. This traditional branch of law not only tackles questions which concern every lawyer, whatever is his legal expertise, but it also concerns on a worldwide scale each person's most fundamental rights, such as his right to bodily integrity, his right to a manworthy existence and his property rights. The way a legal system protects rights and interests through, among others, tort law co-determines the degree of civilisation and the development of a given society. However, no matter how fundamental tort issues may be, it is striking how the solutions offered in one system can be very different and sometimes quite diverse from those in another. There are basic differences in approach between the legal systems and the dividing line does not always match the classic divide between the countries of the Civil Law tradition and those belonging to the Common Law tradition. In the General Introduction, particular attention will be paid to the aims of the law of Torts and to the distinction between tort and crime and to the relationship between tort and contract (is concurrence between tortious liability and contractual responsibility permitted or not? what about precontractual liability?). For each country, the scope of protection will be tackled as well (are all interests equally protected?). The Author. Table of Contents. List of Abbreviations. Part I. Liability for One's Own Acts. Part II. Liability for Acts of Others. 2. Liability of Parents, Teachers and Instructors. 3. Liability for Handicapped Persons. 4. Liability for Things and Animals. Part III. Forms of Strict Liability. 1. Road and Traffic Accidents. Part IV. Defenses and Exception Clauses. 1. Limitation of Action (suspension and interruption). 3. Assessment and Compensation of Damages. 4. Personal Injury and Death. 5. Various Damages (property) . 6. Interference with Collateral Benefits. 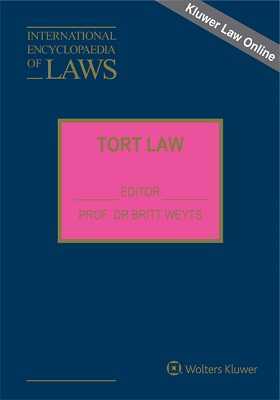 GENERAL SECTION: List of Contributors; Introducing the International Encyclopaedia of Tort Law; Curriculum Vitae of the Editor.